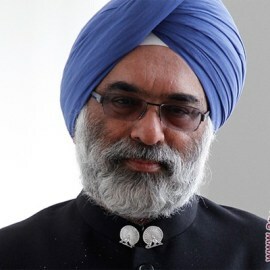 Mr Gurjit Singh schooled at the Mayo College, Ajmer and obtained his Bachelors Degree with Honours in Politics at the St. Xaviers College, Kolkata. He is a Post Graduate in International Studies from the School of International Studies, Jawaharlal Nehru University, New Delhi. He has also attended programmes at the Indian Institute of Foreign Trade, Indian Institute of Mass Communications and the Indian School of Business. Appointed to the Indian Foreign Service in 1980, he has served in Indian Missions in Tokyo (twice), Colombo, Nairobi, Rome and was the Ambassador of India to Ethiopia, Djibouti, Indonesia, Timor-Leste, ASEAN, Germany, the Representative of India to the African Union, the Economic Commission for Africa and IGAD. He is proficient in Japanese and has published The Abalone Factor An overview of India-Japan Business Relations in 1997 which also won him the Bimal Sanyal Award for Research by a Foreign Service officer. His subsequent books included The Injera and the Parantha : Enhancing the Ethio-India Relationship which was released by the Prime Minister of Ethiopia in 2009. His book 'Masala Bambu' on India and Indonesia was released by the Minister for External Affairs in Jakarta in April 2015. He is also author of a comic book on the legacy of the India-Indonesia relationship. His edited book “Opportunity Beckons: Adding Momentum to the Indo-German Partnership” was released in January 2017 in Berlin. He has frequently contributed on economic, developmental and trade issues to various journals and books. He has an abiding interest in developmental economics and issues of sustainable development. While in Nairobi, he was the Deputy Permanent Representative of India to UNEP and UN-HABITAT. He is also an Honorary Professor at the IIT, Indore. Mr Gurjit Singh is an avowed cinema buff and is extremely fond of cricket. He is a qualified umpire from the Kenya Cricket Association. He enjoys travelling, learning about different cultures and trying out new cuisines.